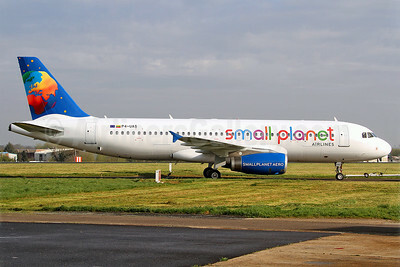 Small Planet Airlines (formerly FlyLAL Charters) (Vilnius) is expanding its charter fleet. It is billing itself as the fastest growing charter airline in Europe. The charter airline is leasing five additional Airbus A320s. The first A320 was added in April 2011. The remaining two aging Boeing 737-300s should be retired at the end of the current summer season. The current fleet serves the Polish charter market along with the UK, France and Lithuania. Small Planet Airlines works with the major tour operators to bring holiday travelers to Greece, Spain, Turkey, Egypt and other sunny destinations. The company also charters flights for the government, sport teams and private customers. Top Copyright Photo: Keith Burton. Formerly operated by Air Astana, Airbus A320-232 P4-UAS is becoming LY-SPB (msn 2987) with Small Planet. All other images and photos below from Small Planet. This entry was posted in Small Planet Airlines and tagged 2987, A320, A320200, A320232, Air Astana, Airbus, Airbus A320, Airbus A320200, aviation, charter airline, LYSPB, P4UAS, SEN, Small Planet Airlines, Small Planet Airlines Lithuania, Southend, transportation on May 1, 2013 by Bruce Drum.